Dedicate the 5th (Tue) to wine at some of the top wineries in the area. The adventure continues: take in panoramic vistas at Space Needle, wander the streets of Pike Place Market, examine the collection at The Museum of Flight, and admire the masterpieces at Chihuly Garden and Glass. For where to stay, other places to visit, more things to do, and tourist information, refer to the Seattle trip app . Boston to Seattle is an approximately 8.5-hour flight. You can also drive; or take a train. You'll gain 3 hours traveling from Boston to Seattle due to the time zone difference. In May, plan for daily highs up to 68°F, and evening lows to 52°F. Finish your sightseeing early on the 5th (Tue) so you can travel to Portland. Change things up with a short trip to Multnomah Falls in Bridal Veil (about 46 minutes away). 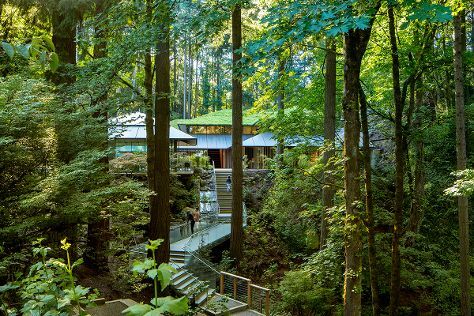 And it doesn't end there: admire the natural beauty at Portland Japanese Garden, steep yourself in history at Pittock Mansion, hike along Forest Park, and head outdoors with Portland Timbers. To find traveler tips, more things to do, reviews, and more tourist information, read Portland trip planner . Traveling by flight from Seattle to Portland takes 3 hours. Alternatively, you can drive; or take a bus. In May, daily temperatures in Portland can reach 70°F, while at night they dip to 51°F. Finish your sightseeing early on the 9th (Sat) to allow enough time to travel to St. Helena. Take a break from St. Helena with a short trip to The Hess Collection Winery & Art Museum in Napa, about 36 minutes away. Dedicate the 10th (Sun) to wine at some of the top wineries in the area. The adventure continues: learn about winemaking at Modus Operandi Cellars, look for gifts at Oxbow Public Market, view the masterpieces at Mumm Napa, and take a memorable tour with Tours. To see where to stay, traveler tips, photos, and other tourist information, read St. Helena road trip planner . You can fly from Portland to St. Helena in 4.5 hours. Alternatively, you can do a combination of flight and bus; or drive. When traveling from Portland in May, plan for a bit warmer days in St. Helena, with highs around 76°F, while nights are about the same with lows around 48°F. Finish up your sightseeing early on the 13th (Wed) so you can travel back home.